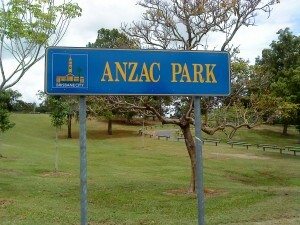 Lord Mayor Campbell Newman reacted angrily in Council this week to accusations he was desecrating Toowong’s ANZAC Park. Opposition leader Shayne Sutton said Cr Newman was “willing to trample over the ashes of our fallen soldiers” by setting up a car park in the recreation area. The car park is proposed for construction workers building the Northern Link tunnel from Toowong to Kelvin Grove. Saying the plan was “temporary in nature” and designed to prevent congestion in suburban streets, Cr Newman said he was outraged at Cr Sutton’s comments. He pointed to his record as an army officer and his family’s record of service. Cr Newman said he was still a major in the Reserve. “Don’t wrap yourself up in the Australian flag ’til you’ve served in the defence force,” he said to Cr Sutton. But a campaigner against the car park plan, Toowong resident Mr Iain MacPhail, criticised Cr Newman’s comments. He said it sounded a lot like the Mayor was “taking ownership of any sense of Australian spirit”. Mr MacPhail said there were other areas suitable for the car park plan that had been “overlooked”. He said many were concerned at the consequences of having a car park next to a children’s play ground. “ANZAC Park “is the best playground I’ve ever seen,” he said. “If the car park was built there, the playground would have to go,” he said. There is nothing ‘temporary’ about trampling on the ashes and urns of our DIggers. Lord Mayor Newman will find this out for himself next BCC election in March 2012 where even the staunch lifelong liberal voters in Toowong have promised they will not be voting for Cr Matic or the LNP. Shame on you Lord Mayor and your Northern Link Team! When Lord Mayor Newman allows bulldozers onto the site to remove grass and soil to construct his car park he will be allowing bulldozers to dig up the ashes of returned soldiers. That is a desecration!! Australia gets very upset every time Turkey touches a rock on the Gallipoli peninsular yet the Lord Mayor gets upset at anyone rightly condemning him from the same destructive actions in ANZAC Park.